When it comes to my travel the quote 'Leave No Stone Unturned' springs to mind. That's how travel should be, from exploring the furthest corners of the earth, to discovering hidden treasures on your doorstep, taking in a deep breath of the new and undiscovered is like waking up to a sunny day every day, it never gets old. And so it was with Slovenia. The first time I came for love. Now I return again and again.As I have come to love not only the man but his country as well. Slovenia captures your heart, it takes your breath away with its majestic beauty. One visit is never enough, there's far too much to see, to experience, to indulge. It's a haven for creative types, artists, writers, poets, painters, the vast mountainesque landscape gets my creative juices going and has so far inspired a children's book and a food project (coming soon). It's happened. We are here. We made the BIG move. We packed up everything we owned (and some stuff we didn't) and drove 16 hours across Europe to our new home. Size isn't everything. It's what you do with it that counts. The Slovenian coastline measures less than 50 kilometers. That's 30(ish) miles. They may be lacking in quantity, but Slovenes certainly make up for this in quality. This stretch of land is exquisite. 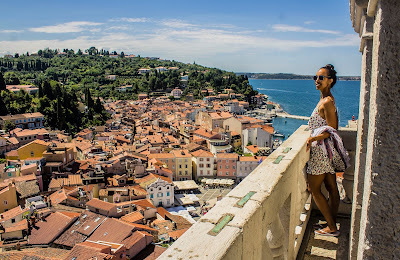 From Portoroz to Piran, Izola to Koper. Each town is individual with their own distinct character and feel. I've travelled to many places near and far, it would be a crime not to, as the world is glittered with so many treasures for us to explore. But when I saw Piran, my heart did a little skip. Summer may be drawing to a close this side of Europe but there are still sunny days to be stolen here in Ljubljana, with temperatures regularly hitting the low 20's. So armed with sunglasses, lip-gloss and an adventurous spirit I grabbed my bike and off we went. Opening in August this year, the latest addition to the InterContinental family adopts a commanding position, as the tallest hotel, in the centre of Slovenia's capital, Ljubljana. 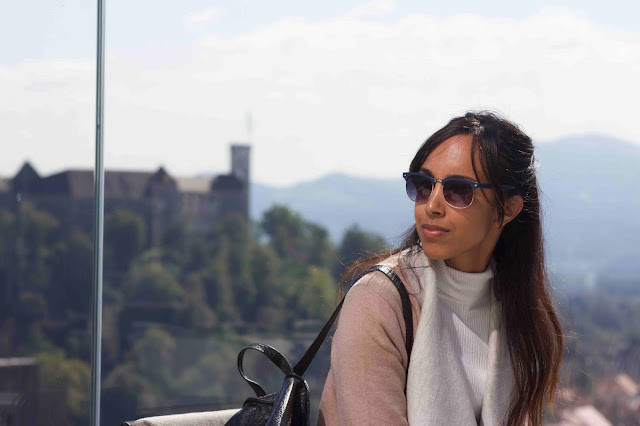 We headed immediately for the rooftop terrace, a must for any discerning Ljubjanites, and ooohed and aaahed over the panoramic views of the city, I could see the castle! This sweet spot is perfect for sunset cocktails and exclusive parties - eventprofs anyone?